The Eleaf iStick QC 200W MOD is one of Eleaf's most popular MOD model, with a powerful 50A / 200W output and a 5000mAh capacity battery, will provide you with the best smoking experience, six colors for you to choose. 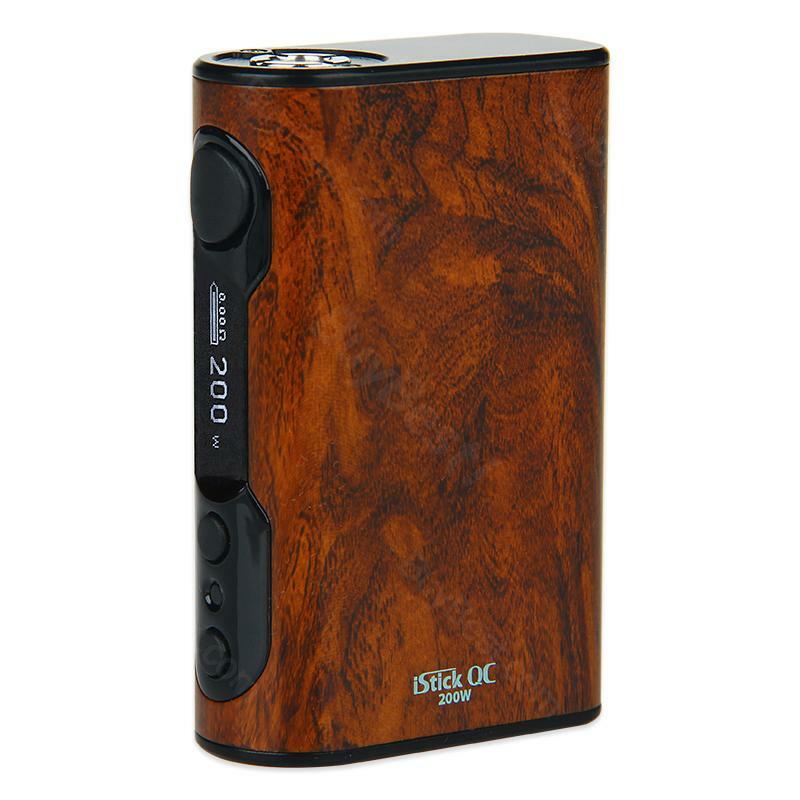 The Eleaf iStick QC 200W MOD is one of Eleaf's most popular MOD model, with a powerful 50A / 200W output and a 5000mAh capacity battery, can provide a maximum smoke and long battery life. The iStick QC 200W has a dual-circuit protection charging feature that protects you when you charge. At the same time, you can also choose RC adapter as an attachment, you can convert the 510 connection to USB output and switch to mobile power mode when you need it. This MOD will provide you with the best smoking experience, six colors for you to choose. Power on/off: press the fire button 5 times in quick succession to turn on/ off the device. Keep holding the fire button to take a puff when the device is powered on. Stealth on/off: Press the fire button and down button simultaneously when the device is powered on to switch between stealth on and stealth off mode. Adjustment buttons lock/unlock: Keep pressing up button and down button simultaneously for two seconds when the device is powered on, the the up and down buttons will be locked and the screen will display "Lock". Repeat it to Unlock the buttons. Switch display mode: Keep pressing up and down button simultaneously for two seconds when the device the powered off, the screen display will rotate 180 degree. You can view the screen from two different angles through this operation. Preheat function: In power-off state, keep holding up and fire buttons till the M1 mode appears, press the fire button 3 times to "power" and press up or down button to adjust the wattage of preheat; press the fire button again to "time", and press up or down button to adjust the second of preheat or turn off the preheat function. Charge a cell phone: Screw an RC adapter (not included) on the device and connect it with a cell phone by a USB cable. When the device is powered on, press the fire button once to start to charge the cell phone. Switch vaping modes: When the device is powered on, press the fire button 3 times in quick succession, the device will display current vaping mode. Press the up or down buttons to switch among VW/Smart/ USB charge/ TC-Ni/ TC-Ti/ TC-SS/ TCR-M1/ TCR-M2 and TCR-M3 modes. Custom Logo: Download the file on Eleaf site, plug the device in with USB cable to a computer, and double click the Eleafupdate.exe. Then click "logo" and open the image you choose to put it in the device. Finally press the fire button twice in quick succession when the device is powered on to enter logo on/off interface and press up or down button one time to turn on/off logo. • 3 months for Eleaf iStick QC MOD. Please check Guarantee Policy. The product arrived soon and works fine. I love it. I had one of it earlier and that works fine but I needed one when one of them is on a charger. Big powerful mod. I choose iStick QC 200 for its long-lasting output and beautiful looking. It didn't let me down. A perfect product. This is the most expensive mod I ever bought. It works great. And the service is nice at this shop. I'm very pleased. I like this battery. It feels not very heavy. And the appearance is very appealing. I will recommend QC200 to my friends. It's so gorgeous. Works perfect with my ELLO and drop tank. The battery last long time and it can support a day use. Thanks to Eleaf they produce many good quality products.